The longest beach in Mauritius, is the famous Le Morne Beach in the remote south west parts of the island. With the exception of a small waterway passage and a few rocky spots, it stretches for almost 7 km, and covers half of the peninsula foot of Le Morne Brabant. The beaches in south Le Morne are popular with kite surfers due to the currents around the Le Morne peninsula. With only a few luxury hotels sharing the resources, and with virtually no residential areas, there is plenty of room for everyone. Rivals in the same league include the popular 5.8km Flic en Flac Beach on the west coast, as well as the east coast Belle Mare Beaches which is also a few kilometres long. Contrary to popular belief, the coastline of equally popular Grand Baie, sports a sandy beach of a mere few hundred metres and tends to get crowded during peak season. 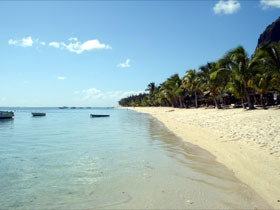 Other major beaches include Trou aux Biches and Mont Choisy in the north west, where many local festivals are held, as well as the popular beaches around Ile aux Cerf in the south east and Ile aux Benitiers in the south west (pictured in the Bungalow Vanille header above). Several undeveloped beaches in the south are similar in length, such as Riambel Beach and La Praire beach. As of October 2011, BeachMap-Mauritius.com is conducting an extensive mapping project with the intention of mapping all public beaches in Mauritius.